‘The Treaty of Waitangi Collection’ - BridgetWilliams Books - This Collection is a landmark digital resource. It is the new home for Treaty scholarship online, combining award-winning histories with diverse commentary. IEEE/IET Xplore Digital Library is particularly used by computing & electrical engineering students but of possible interest to others as well, the IEEE Xplore digital library is a powerful resource for discovery of and access to scientific and technical content published by the IEEE (Institute of Electrical and Electronics Engineers) and its publishing partners. It provides web access to more than three-million full-text documents from some of the world's most highly cited publications in electrical engineering, computer science and electronics. Britannica ImageQuest is a vast database of images that students and staff can use, with access to nearly 3 million images, from over 50 of the world’s best and respected image libraries. All images are rights-cleared for educational use. Students now have greater access to Unitec's print journals as they can borrow individual issues for 3 days with 2 auto-renewals (as long as another person has not requested it). 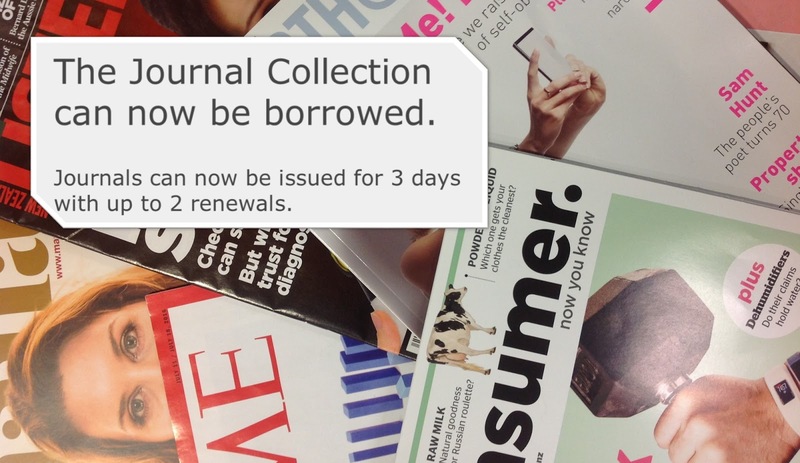 There are a small number of journals that cannot be borrowed but these are clearly labelled as Not for Loan with the majority of the journal collection now available to both staff and students. You can find out if we have a specific journal title by searching the library catalogue in the librarysearch and by browsing the library shelves. You will notice the most recent issues are on a display shelf at the front with older issues in boxes on the shelf behind. The call number is the number on the box as well on the journals. Hub Library - on the east side level 1 (ground floor) near the training room. Building 1 Library - the first 2 double sided rows of shelves on right side next to the catalogue computer. Waitakere Library - next to the General Collection, before the 001s. For customer services and lending inquiries, Contact Us. Chat with us online. Live Help. Your voice and my voice are expressions of identity. May our descendants live on and our hopes be fulfilled. Argentina, Australia, Austria, Bangladesh, Cambodia, Canada, Croatia, Fiji, Finland, Germany, Indonesia, Italy, Japan, Kenya, Kiribati, Korea, Lao, Lebanon, Libya, Lithuania, Malaysia, Mexico, Nepal, Netherlands, New Zealand, Nigeria, Pakistan, Plaestine, Papua New Guinea, Philippines, Russian Federation, Samoa, Singapore, South Arica, Sri Lanka, Sweden, Switzerland, Taiwan, Thailand, Tonga, Turkey, UK, US, Vietnam. International language week is now on from 15th until 19th August 2016. The library welcome everyone to participate in a small activity we organize at the Hub library foyer. There is a known problem with the new Ebook Library platform. The first time you select and open an Ebook Library book, the ebook opens and is usable. If you then want to open another Ebook Library ebook, your first ebook will reopen. This problem occurs on all browsers. Currently the only way to clear the title is to clear the browser cache. Proquest, the supplier of these ebooks, is working on this issue. On Sunday 21st August there will be an outage to all Unitec PeopleSoft systems from 6am to 6pm for scheduled maintenance. This outage may impact the ability to login to LibrarySearch to see any items you have on loan or to request print books. Here are some links to information about the Olympic 2016 in Rio de Janeiro. Find out more about New Zealand at the Rio 2016 Olympic Games. Follow our athletes' journeys and discover their stories. The week is a chance for all Kiwis to celebrate the rich language and culture of the Cook Islands. In New Zealand, just over 20% of our Pacific population are Cook Islanders (61,839 people), our second largest Pacific ethnic group. As a realm territory, the Cook Islands also hold a special relationship with New Zealand, with Cook Islanders free to live and work in NZ. There is a huge range of events and activities across the country to mark the week.